Mutant: Year Zero – Zone Compendium 2 – Dead Blue Sea is the second supplement for Mutant: Year Zero – Roleplaying at the End of Days, the post-apocalypse set RPG based on Mutant - År Noll, the Swedish RPG from Free League Publishing released in English by Modiphius Entertainment. As with the first, Mutant: Year Zero – Zone Compendium 1 – Lair of the Saurians, Mutant: Year Zero – Zone Compendium 2 – Dead Blue Sea is a slim thirty-two page supplement that presents various scenario set-ups and situations as well as new rules, but where in Mutant: Year Zero – Zone Compendium 1 – Lair of the Saurians these scenario set-ups and situations and new rules could be quickly and easily dropped into a GM’s campaign and the sectors of his Zone map, this is not quite the case with Mutant: Year Zero – Zone Compendium 2 – Dead Blue Sea. 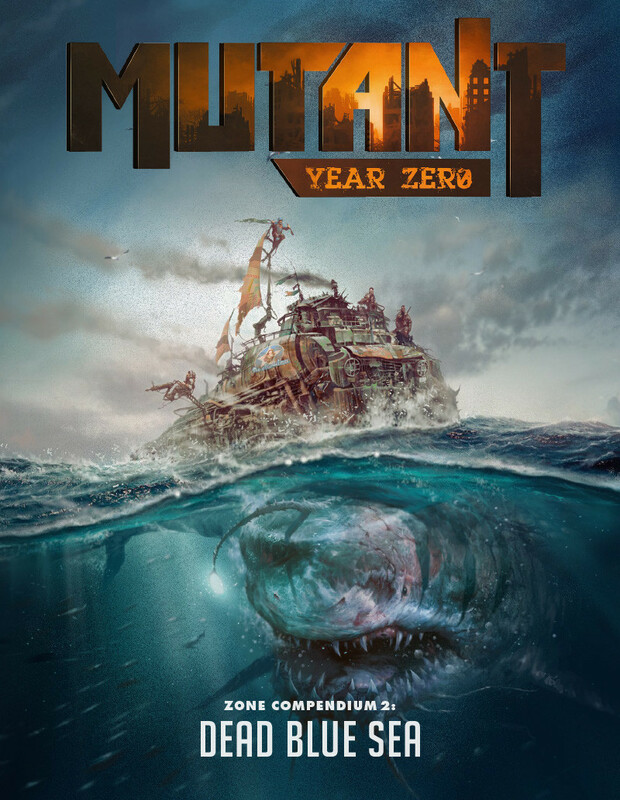 This is not actually a criticism of the supplement, but rather a reflection of its content and the changes it will make to a campaign, for as its title suggests, Mutant: Year Zero – Zone Compendium 2 – Dead Blue Sea takes the Mutant: Year Zero RPG to sea. What Mutant: Year Zero – Zone Compendium 2 – Dead Blue Sea does share with Mutant: Year Zero – Zone Compendium 1 – Lair of the Saurians is impressive productions values. They are the same as those of the core rulebook. The supplement is done in full colour, the illustrations are good, and the maps—more exploded diagrams than two-dimensional maps—are nicely done. True, they do not show every detail, but they show enough and from their overall descriptions, the GM will be able to describe the rest of the location with ease. Overall, this is a sturdy little book that feels good in the hand. In taking Mutant: Year Zero to sea, Mutant: Year Zero – Zone Compendium 2 – Dead Blue Sea sets up two options and supports them with various chanes. The first is taking an existing Mutant: Year Zero campaign onto the water, the second is having a campaign start there. To do this, it gives a whole zone to explore, much as Mutant: Year Zero did for the Big Apple and Big Smoke in the core rule book; replaces inappropriate mutations that do not work at sea; and adds new rules for running a game at sea, setting up an Ark at sea, and handling boats and travel. It adds rules for zones at sea as well as threats and artifacts plus four Special Zone Sectors—‘Cage Island’, ‘Oilfields of the Ancients’, ‘Drifters from Afar’, and ‘Ghost Ship’. The changes start with two Mutations, ‘Cryokinesis’ and ‘Human Toad’, being given to replace two Mutations, like ‘Frog Legs’ and ‘Tracker’, which do not work so well at sea. The first enables a Mutant to freeze an opponent, water, or a fire, whilst the latter lets a Mutant catch objects and creatures with his tongue, secret a poison through his skin, and hibernate. Rules for conflict at sea cover swimming and its dangers, whilst those for weapons note that bullets are not popular as they are on land, either for firing from guns or for use as currency, because gunpowder gets wet. Instead, harpoons are employed because they can be used on and under the water, and once fired, their lines can be hauled back and the weapons reloaded. Various places are suggested to place the player characters’ Ark, such as a lighthouse, an oil rig, or the top of a skyscraper protruding from the water. New projects for a water-based Ark include a Distillery—since potable water is scarce at sea, a Sail Loft for sewing sails for boats and ships like the Scrap Sloop, Scrap Ship, Sail Catamaran, that an Ark can also build. The dangers and difficulties of a Sea Zone are also highlighted, not just how the weather and night can affect travel, but also how the seas and winds are in constant motion, which means that the Rot—the nuclear, biological, and chemical after effects of whatever it was that caused the Apocalypse and which can accumulate in a Mutant’s body and mutate him further if not outright kill him—is constantly churning and moving, dispersing and accumulating. Given the change in environment and its dangers that the supplement describes, it should be no surprise that Mutant: Year Zero – Zone Compendium 2 – Dead Blue Sea gives new and numerous threats that the player characters might encounter. These include merchant convoys, whalers, slavers, and castaways as well as menagerie of waterborne monsters, such as Steel Sharks that chew and eat everything, Strangle Weed that ensnares and strangles, and legendary things like Rotzilla and the Kraken, which ascend from the depths to rampage or fight each other, and so cause great waves to crash across the zone. The first of the four Special Zone Sectors is ‘Cage Island’. Located on a heavily fortified scrap island, this trading post is a home to exiles from across the zone and is a growing and well-organised mercantile nexus. It is also a slave-trading centre, but goods of all sorts, including artefacts, can be found here too. Plot hooks suggest that colleagues of the player characters have disappeared there, that the merchants at ‘Cage Island’ are spying on the player characters and the Ark, and more. The second, ‘Oilfields of the Ancients’ describes a quartet of four oil rigs that are still operating, their lights are on, flames still soar into the air, and oil is still being pumped from the depths. Half-staffed by clones, the oil rigs, being from before the apocalypse, contain a hoard of artefacts and are rumoured to hold large stockpiles of food. Plot hooks include a civil war aboard the rigs, the rigs taking an interest in the Ark, an attack by a rival energy concern, and more. The drifters in ‘Drifters from Afar’, the third Special Zone Sector, live aboard a floating village, part of fleet that has split up and sailed away from the Mothership. The villager aboard are looking to trade and more as the player character may get caught up in strange customs or a war between rival floating villages. The last of the four Special Zone Sectors is ‘Ghost Ship’, an immense luxury cruiseship long abandoned and given over to the Rot and other things. This is essentially a floating dungeon to explore and loot, but can be used in other ways, perhaps as point of conflict between rival groups, the site of a rescue mission, and so on. All four of these Special Sector Zones are decently done, but they are not quite as interesting as those given in Mutant: Year Zero – Zone Compendium 1 – Lair of the Saurians. Further, they are more difficult and challenging to use primarily because the environment they are set on—the ocean—is difficult and challenging to run and play. This is difficulty is present from off if the GM is setting his campaign and the Ark on the water, but the challenge and difficulty are added to game if the GM switches his campaign from land to water. Of course, should the GM set his campaign on the water, Mutant: Year Zero – Zone Compendium 2 – Dead Blue Sea does not neglect the campaign at the heart of Mutant: Year Zero, explaining how the metaplot can be adapted to life on the ocean waves. The problem with Mutant: Year Zero – Zone Compendium 2 – Dead Blue Sea is that you have Mutant: Year Zero then Mutant: Year Zero – Zone Compendium 1 – Lair of the Saurians is an obvious first choice as a purchase because it more obviously expands on the starting Zone and extends it play area than does Mutant: Year Zero – Zone Compendium 2 – Dead Blue Sea. That said, if you want to start your Mutant: Year Zero campaign at sea or take it to sea, then Mutant: Year Zero – Zone Compendium 2 – Dead Blue Sea is what you need—it is a specialist supplement, but its speciality is decently done.